Ever since seeing Pee-Wee's Big Adventure, I've wanted to see a movie at the drive-in. I know they still exist, but I've yet to cross that activity off my movie-themed bucket list. In fact, I may make that my mission this summer, especially in light of today's special Google Doodle, which celebrates the "birth" of the drive-in. R.M. Hillingshead of Camden, New Jersey is the man who birthed the idea of a set-up that allowed people to watch movies from their cars, and brought the concept to fruition with the first drive-in opening in New Jersey on June 6, 1933. The idea apparently didn't really catch on until the late-forties though and the popularity of these theatesr seemed to peak around the 50's and 60's. There aren't as many around out there as there used to be, but they are still out there. 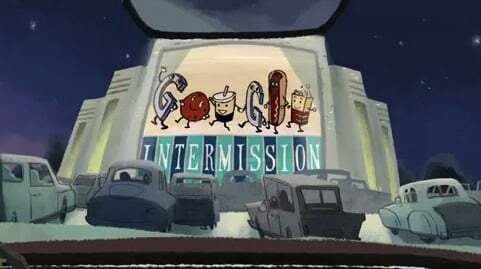 As you may have noticed, if you've visited Google today, to honor the 79th anniversary of the first drive-in movie theater, today's Google page features this adorable little animated video. Google's known to work their name into their doodles, and this 31-second video was no exception. We found a couple worked in there. Once you've watched the video, take a look at the screenshots below and let us know if we missed any! The last one's a bit harder to see than the rest, but it's there! And then of course, there was the popcorn. Did we you catch any that we missed?